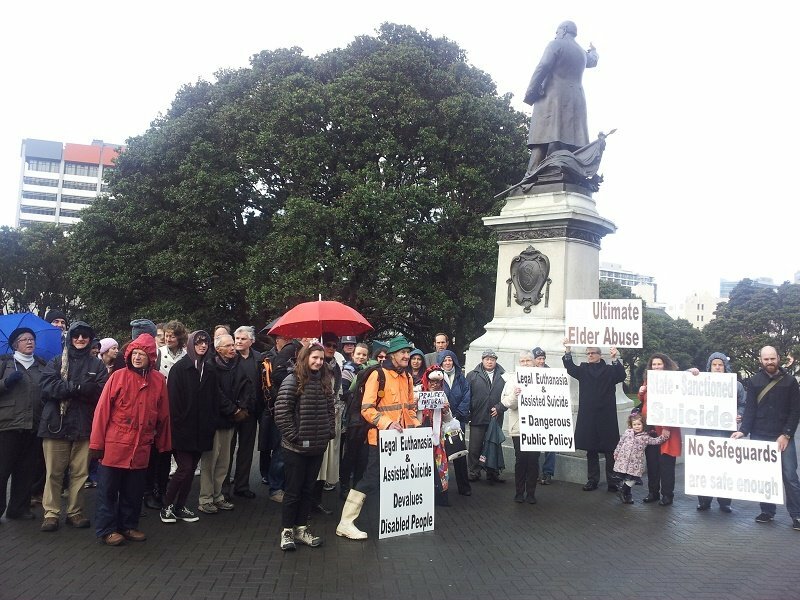 Yesterday about 90 people from diverse walks of life gathered in front of parliament to demonstrate against the legalisation of euthanasia and assisted suicide. Most of them waited close to the fence while the Voluntary Euthanasia Society presented their petition about “assisted dying” to MP Iain-Lees Galloway, while a small group held up signs on Council ground outside the entrance. Due to parliamentary regulations they were only allowed to demonstrate on parliamentary grounds from 12.30 pm. The aim of this inter-organisational demonstration, organised by Euthanasia-Free NZ, was to draw attention to the wider implications of euthanasia and assisted suicide legislation. Some signs alluded to the risk of legal euthanasia and assisted suicide being a vehicle for the ultimate elder abuse and a means of state-facilitated suicide. Other signs stated that legalisation devalues disabled people and that “no safeguards are safe enough” to prevent abuse, coercion and lives being ended without consent, as research from Belgium and the Netherlands confirms. Supporters included teenagers, tertiary students, mothers with young children, elderly and disabled people, professionals taking an early lunch break, as well as members of Maori, Pacific Island, South African, Dutch and various Asian communities. A few supporters traveled from other cities especially to take part in this event: One elderly woman came all the way from the Hawkes Bay and a young mother flew with her baby from Hamilton. Two people intended to drive from Whanganui, but were detained by flooding. Bob McCoskrie, the director of Family First, was in Wellington for their one-and-a-half day High Court hearing. Since it finished earlier than expected he was able to join the peaceful gathering. The group was in stark contrast with the about 35 pro-euthanasia supporters who gathered in front of parliament for the occasion: The latter consisted mostly of elderly European women and a handful of elderly European men.